Guitar Center Professional (GC Pro), the outside sales division of Guitar Center that focuses on the needs of professional users, has regularly collaborated with Make-A-Wish Southern Nevada, a chapter of the national organization that grants the wishes of children diagnosed with life-threatening medical conditions in the United States and its territories, to provide access to musical instruments and professional audio equipment for children in the program. Most recently, the GC Pro office in Las Vegas worked with the southern Nevada chapter to make the dreams of two young DJs come true. In the cases of Kyle and Diego, two youngsters suffering from debilitating, life-threatening conditions, GC Pro fulfilled their wish list. 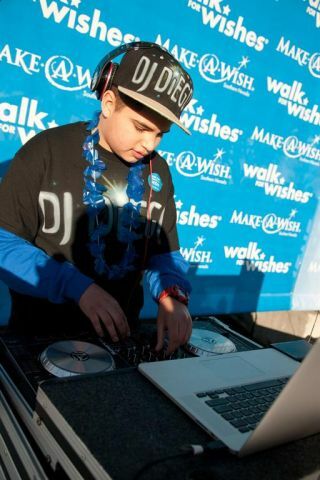 Make-A-Wish Southern Nevada program participant Diego, performing with his new DJ gear at a recent 5K event held by the organization. “These kids are amazing,” said John Stevens, the account manager at GC Pro’s Las Vegas office who acted as the liaison for the project and for other similar collaborations since June of 2013. “They’re up against some serious illnesses — Kyle is permanently in a wheelchair and Diego has a serious neurological condition. But they are both really focused on becoming DJs. We wanted them to have the tools to achieve those dreams.” And that’s exactly what’s happened — both kids are already using the gear to play shows and concerts in front of substantial crowds.